The Admiralty Research Laboratory (ARL) was a research laboratory that supported the work of the UK Admiralty in Teddington, London, England. During the First World War, the Anti-Submarine Division of the Admiralty had established experimental stations at Hawkcraig (Aberdour) and Parkeston Quay, Harwich, with out-stations at Dartmouth and Wemyss Bay, to work on submarine detection methods. The Admiralty also established an experimental station at Shandon, Dumbartonshire, working with the Lancashire Anti-Submarine Committee and the Clyde Anti-Submarine Committee, which subsequently moved to Teddington in 1921, becoming the Admiralty Research Laboratory. Its main fields of research expanded to include oceanography (it housed the National Institute of Oceanography, 1949–1953); electromagnetics and degaussing; underwater ballistics; visual aids; acoustics; infra-red radiation; photography and assessment techniques. 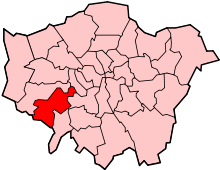 It moved to Teddington, southwest of London, so that it could benefit from the expertise of the National Physical Laboratory. Alister Watson (1940s-1965), suspected Soviet spy. Jack Darbyshire (1943 -1945) Mathematician, Physicist and Oceanographer, "Group W"
↑ RV Jones Papers Archived April 6, 2007, at the Wayback Machine. ↑ Wright, Peter; Greengrass, Paul (1987). Spycatcher. pp. 250–260. ISBN 0-85561-166-9. ↑ Bio-details here Archived August 7, 2007, at the Wayback Machine. ↑ Peter Wright, Spycatcher, Toronto 1987, Stoddart Publishers, Chapter 2.